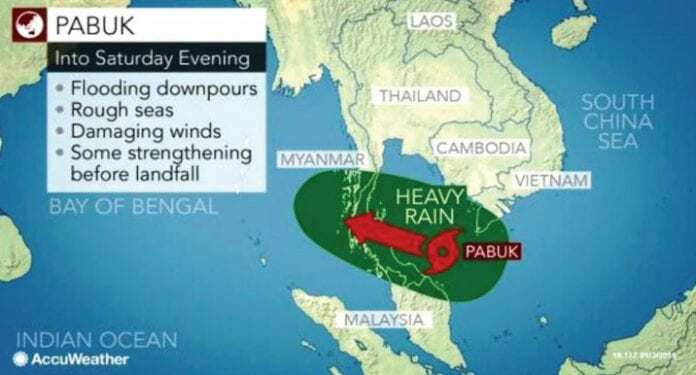 Early warning and early action helped ensure that tropical storm Pabuk, which struck the southern region of Thailand from 3rd to 5th January, passed with limited loss of life. The storm, however, caused high economic losses and considerable damage to critical infrastructure, including schools and hospitals. Warnings were first issued on 1st January, when Pabuk was still a tropical depression. By the time the storm made landfall, authorities had evacuated about 30,000 people living in the coastal districts into shelters. They also suspended flights and ferry services, raised red warning flags on the beach to ban swimming, and advised fishermen to stay ashore. According to Thailand’s Disaster Prevention and Mitigation Department, Pabuk affected 212,784 people across 2,635 villages in 18 provinces. Seven people were reportedly killed, two of whom were volunteers who died during rescue missions. Ahead of the storm, many worried of a repeat of tropical storm Harriet, which killed around 900 people in 1962. “Even though this storm was very powerful and comparable to tropical storm Harriet, a good weather forecast system, as well as an advance disaster warning and evacuation, ensured there were only a few casualties,” said Seri Supharatid, Director of Rangsit University’s Centre on Climate Change and Disaster, in an interview with Thailand’s The Nation newspaper. After the storm passed, the most affected areas in southern Thailand continued to struggle with flooding, uprooted trees, downed electric poles, and flattened fruit plantations. As the storm struck during the peak tourism season, it threatened the livelihoods of thousands who depend on income from tourism. While there is no official estimate yet of the total amount of damage, the Thai Chamber of Commerce’s Centre for Economic and Business Forecasting, estimates economic losses at around 150 million U.S. Dollars. This reinforces a trend seen elsewhere in the region, where improvements in early warning systems and disaster response have resulted in fewer deaths, but the economic cost of disasters continues to rise due to more people and economic activity being concentrated in in high-risk coastal areas. According to the Bangkok Post, Pabuk damaged around 435 schools and up to 29 public hospitals: Hospitals, critical infrastructure, and public service facilities play an important role in recovery and rehabilitation efforts after a disaster. The Sendai Framework for Disaster Risk Reduction, the global plan for reducing disaster losses, seeks a substantial reduction in damage to critical infrastructure. This target will be a key area of focus for UNISDR advocacy in 2019. Thailand is moving to implement the Sendai Framework with national and local strategies for disaster risk reduction by 2020. Having a Sendai Framework aligned national disaster risk reduction strategy is critical to informing how a country assesses its risks, develops its plans and allocates resources to implement disaster risk reduction measures. The strategy also ensures that a multi-stakeholder approach is adopted, and more importantly, that all members of society, especially the most vulnerable, are protected from the most negative effects of disasters.